Hi Betty, The silver is so beautiful and a cherished treasure for you. Love, love, love your turkey plates! The turkey is great too. I love your festive table...the plates are great. Beautiful silver. What a cozy table! I have always wanted to have dinner by the fireplace. I love your turkey plates, and that twig turkey is just too darn cute! I don't think I've ever seen one so cute! Happy Thanksgiving! There's nothing like a table that mixes old with new. Your mother's memory is so alive in all the keepsakes you've acquired. I hope your Thanksgiving was wonderful! Extremely elegant. Silver pieces are beautiful. I think your twig turkey is delightful. 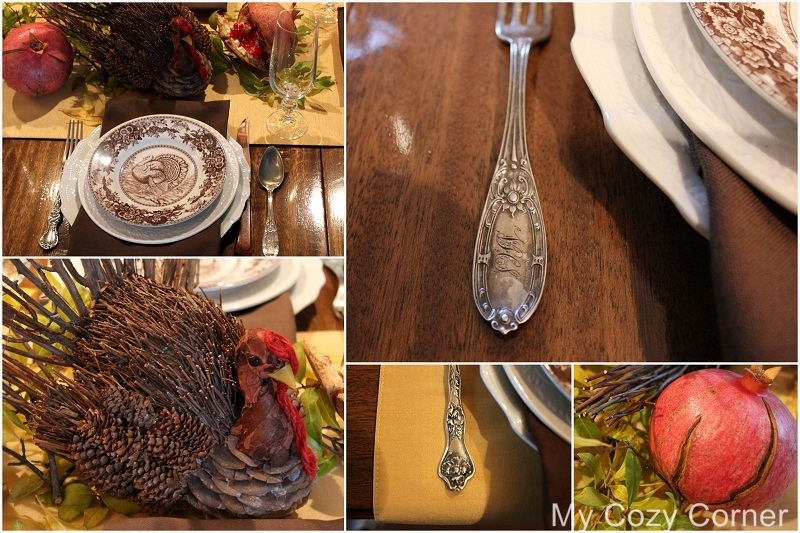 Love that turkey, perfect for your table! What an unbelievable buy that turkey was. Good one! I am smitten by those beautiful silver pieces. I love monograms and that is a special one and the raised design on the other piece. Just lovely.